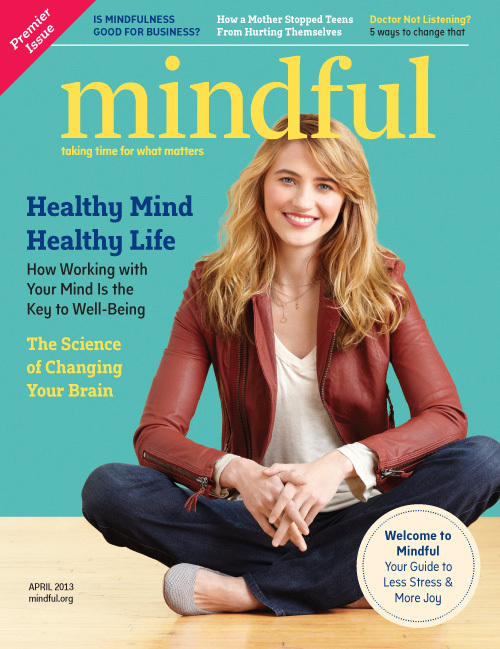 Founder Fiona Jensen talks with Mindful magazine about the origins of Calmer Choice in their April 2013 issue, reprinted below. Her observations dovetailed with statistics being reported around the same time in a 2009 national survey conducted by the American Psychological Association: 28% of teens and 14% of tweens said they “wor- ried a lot” or “a great deal”— and far more than their parents were aware of. The Centers for Disease Control and Preven- tion lists suicide as the third leading cause of death for youth between the ages of 10 and 24. That translates into approximately 4,600 young lives lost each year in the U.S.
Jensen was seeing more and more of it playing out in her community. Six months after that first funeral, there were two more: both teen suicides. Jensen projects that by the end of the current school year the Calmer Choice program will have been delivered in more than 100 classrooms to more than 2,000 students. And it’s not just for teens—kids from kindergarten to twelfth grade, in five different school districts on Cape Cod, now have access to the program. Calmer Choice is collaborating with Tufts University’s Department of Occupational Therapy to measure the outcomes of the program. The results will be shared at the Center for Mindfulness annual scientific conference in April. Calmer Choice has become a full-time job for Jensen (in addition to her other full-time job). But she has no intention of scaling back. “My vision,” Jensen says, “is that in school you learn math, you learn science, you learn history, you learn mindfulness.